View cart “Andre Kole Photo” has been added to your cart. A large 15″ x 23″ full color poster printed specially for collectors. A large Andre Kole show poster printed specially with collectors in mind. This measures 15″ x 23″, and is a full color print suitable for framing. 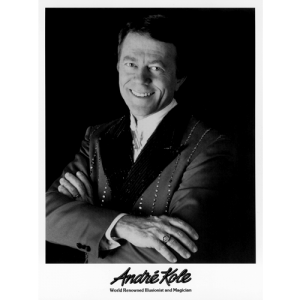 The image is the same as was used to promote Andre’s program for years as both an 11″ x 17″ poster and as handbills. This poster is rolled and shipped separately in a mailing tube.